These words never date as far as I’m concerned (for non-Aussies, it’s an extract from Dorothea Mackellar’s poem, My Country). I particularly love the bits about jewel-seas and far horizons (to prove it, see my last post). And of course, my professional life has been dominated by ‘droughts and flooding rains’ (I worked in catchment management and hydrology for more than a decade). In honour of our ‘sunburnt country’ I’m giving one reader their choice of one of the books I’ve mentioned above. Each of the books makes mention of the Australian landscape in a unique and memorable way. To go into the running to win one of the books, simply leave a comment below, including the name of the book you’d like to win (I’ll use one of those clever randomisers to select the winner and then I’ll contact the winner for their address details). And because I’m lovely (! ), this competition is open to anyone, wherever they live. Of course, feel free to tweet and Facebook the hell out of this page (even though that means more entries… And less chance of you winning… But do it anyway, in the spirit of Australia Day, mateship and all that). Entries close Monday 27th Jan at midnight. I’ll post the winner on Tuesday 28th January. 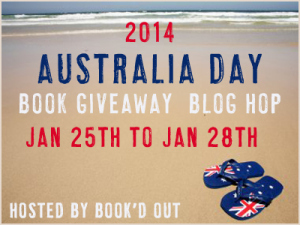 For more chances to win great Aussie stories check out the list of blogs over at Book’d Out. So many fabulous books are up for grabs. COMP is now CLOSED. Winner is Sally Howes. The poem is good – though as the rain batters off my London windows it’s not necessarily made me feel better!!!! I’ve only read Picnic at Hanging Rock and don’t know the other books you list so will look out for those – if I won I’d let that clever randomiser choose which book!! And because I’m lovely too (!!!!!) I’ve done as requested and self-destructed my chances of winning by sharing through my blog and on Twitter! If I don’t win, can you send some sunshine as a consolation prize????! This is a bit scary but I jest not it worked!!!!! 11:27 Sun out over London!!! Alas 11:32 – back behind clouds!!! But was great while it lasted!!!! I would love to win The Engagment by Chloe Hooper – seems right down my alley. Wish you all the best for Australia Day! That book ‘Eucalyptus’ sounds amazing – yes please! As for the Dorothy Mackellar poem, I used to have the most gorgeous illustrated book of that – I wish I knew what had happened to it! And we sang a setting of the poem when I was in year seven, so that’s now going around and around in my head like an earworm… I always loved the ‘Core of my heart’ verses – I’m not a child of the tropics, so the other images are less vivid to me, but we had family in Gippsland and I’m a Melbourne girl, so I always knew what dry countryside looked like, and what it was like after rain. I read Picnic at Hanging Rock a long long time ago. All the other books look interesting. Happy Australia Day! I’m intrigued with the variety of books and authors I’m meeting via Book’d’s hop! Ah, books about the Australian landscape to explore for those of us who are stuck in the city! As with the others, I’ve only read Hanging Rock, but I’d choose, ah, Everyman’s Rules for Scientific Living: A Novel. I was present when Gillian Mears received the Prime Minister’s Literary Award for Foal’s Bread and was impressed that she is handicapped and yet able to be as creative and as gifted as she obviously is. Would love to have a copy of her book! I would love to win The Engagement by Chloe Hooper as I thought the Tall Man was brilliant. Currently reading beautifully illustrated version of Dorothea McKellsr poem ( learning verses I did not know) to my 5 year old son who loves it! Eucalyptus was a brilliant evocation of the Australian landscape as was the much earlier mesmerising Picnic at Hanging Rock (what Victorian born and bred here hadn’t had one!). Shared on Facebook. Thank you. I would love a copy of Foal’s Bread, it’s not available over here and I’ve wanted to read it since your review (and the heartbreaking baby scene). Carrie Tiffany’s book has been on my list for quite a while. Foal’s Bread by Gillian Mears please! I love Picnic at Hanging Rock but I already own a copy of that! Fantastic choices. I would love Picnic at Hanging Rock by Joan Lindsay – I don’t have it, but I’d love to re-read it. I would love to win The Engagment by Chloe Hooper! Eucalyptus looks like a wonderful read…thanks for the great giveaway. I would love to read The Engagement by Chloe Hooper. I named my eldest daughter Miranda after reading the name in Picnic at Hanging Rock when I was in high school. Oh my goodness, this blog hop is amazing. I am having so much fun discovering some fabulous new Australian authors, and remembering some old favourites, too. Thanks for such a great giveaway. It’s an extremely hard choice, as they all sound like fabulous books (there goes the TBR list!). I have Picnic At Hanging Rock here waiting to be read (see what I mean), but if I was the lucky winner, I would be more than happy to own any of the others. To narrow it down though, I really love the sound of Eucalyptus. It sounds very intriguing. Hi! I would like to win a copy of ‘Picnic at Hanging Rock’. I’ve seen the film but never read the book and it would be an interesting comparison. Hello there. I would love to win Foal’s Bread. One of my favourite Australian books that depicts the landscape so beautifully is Tim Winton’s Dirt Music. I loved Eucalyptus too. Thanks for running this comp! I hope I win! A copy of Picnic at Hanging Rock would be my choice. Thank you.